Last summer in a meeting with some fellow Shalem Institute for Spiritual Formation graduates in Atlanta, we prayed and pondered about ways to expose more people to the gifts of contemplative spirituality. Our prayer centered on the impression that most major spiritually oriented events, whether speakers, workshops or retreats, are expensive. Hence, many everyday people whose yearnings for spiritual deepening echo our own simply cannot afford to participate. How could we share the gifts of contemplative spirituality we’d received from programs like Shalem with more people, our congregations, our worship services and bible studies or even our workplaces? Wouldn’t it be wonderful if churches, synagogues, mosques, temples, and offices created more opportunities to pause and bask in the loving Presence of our Creator? I turned to my spiritual and ancestral mentor, Howard Thurman, mystic, theologian, and spiritual adviser to Dr. Martin Luther King, Jr., who shared this same sentiment. He wanted to introduce masses of people to the wonder, peace, and joy of contemplative experience and he wrote about this desire and other topics in Jesus and the Disinherited. Thurman found it both intriguing and inspirational that Jesus chose to conduct his ministry with everyday people, the poor and outcast like himself, and not with the aristocracy or even middle classes of Jewish and Roman society. 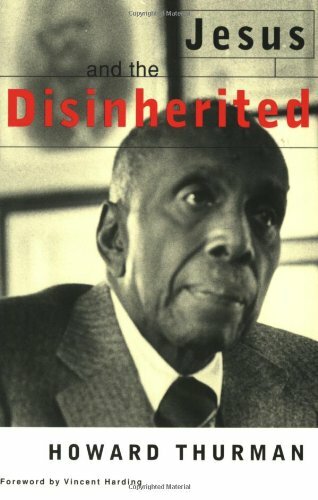 Jesus and the Disinherited became a favorite of Dr. King’s and whenever he marched he carried this classic book. Thurman encouraged Dr. King and other organizers of the Civil Rights movement to utilize contemplative spiritual practices. In particular, he stressed the importance for marchers to examine and cultivate their inner lives before being thrust out into nonviolent confrontation. A strong advocate of seizing moments of Presence—whether in nature, walking down the street or sitting in church—Thurman also knew that introducing silence into a worship service would be a mighty challenge in the 1940’s and 1950’s. So he wrote meditations (Meditations of the Heart, The Centering Moment—see recommendations) for this very purpose. What better way to ease people into a contemplative practice than by anchoring them with a written piece that orients them to the Presence? Stressing the necessity for silent contemplative prayer, he circulated the meditations for that time in the service when members could quiet their hearts and hear the messages always abiding in the Presence. Yet the questions linger. How do we feed those who hunger for spiritual connection, for stillness, for peace? Where and in what ways can we insert openings for moments of quiet reflection, communion with nature, and tranquility of mind that engender a contemplative atmosphere and expand the awareness of Presence? A few years ago my former pastor asked me to conduct bible study when she needed to travel. I prayed and sought to present relevant topics such as, “In God We Trust?” “Practicing Forgiveness,” and “Putting God on the ‘To Do List’.” However, I also felt guided to begin each session with a short meditation by Howard Thurman or Henri Nouwen or Mother Teresa, followed by two to three minutes of silence. Everyone loved it and asked for more. Likewise after organizing a faculty/staff retreat at a local monastery, several people inquired about how to maintain at work the inner peace they obtained. Out of this desire emerged a “Friends of Silence” group on campus so faculty/staff of all spiritual persuasions could sit together for 20 minutes each week. Now as I reflect on those actions and the work of Howard Thurman, I wonder what each of us can do to nurture the contemplative longings of the everyday people we live, work, or worship with each day. What more might you and I do every day? Would reading or listening to some meditations or lectures by Howard Thurman bring more peace to your heart? Look him up on the web and read more about his life and writings by borrowing or purchasing one of the many books he wrote—listen to the wisdom in his audio recordings and YouTube clips that are sure to awaken the Peace and Joy in your heart. A version of this article was previously published in the Shalem Institute for Spiritual Formation e-Newsletter, October, 2014.